Hi!!! This morning, I had quite a bit of free time and my mom wanted to update our decour with some nice China ware. So…. we called up the all knowledgeable Driver Yu for a reccomendation. He directed us to the Jin De Zheng shop on ShanXi Rd. Time for an excursion! 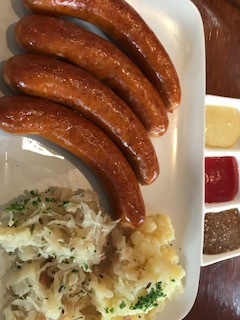 At first, I was skeptical as the German food in Shanghai is lacking at best, but as always, I’m a sucker for grilled meats. In we went! 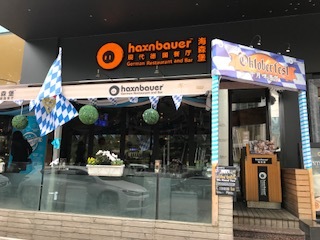 Haxnbauer is a fairly popular Munich based restaurant specializing in traditional Bavarian foods. As the name suggests, it’s known for its haxe (pork knuckle). They have the typical crispy skinned variety as well as more “creative” versions like a cheese stuffed baked Haxe. If a 2-lb hunk of crispy skin, buttery fat and tender meat aren’t up your alley, it has all the traditional sausages. For larger parties, they have “special platters”, with all the fixings. To go with the insane quantities of meat offered, Haxnbauer offers equally traditional sides like pretzel, potato salad, mashed potatoes…. getting the memo? Beef Goulash- My mom doesn’t really have much of an appetizer for heavy meats, so I suggested a soup. She chose the goulash. 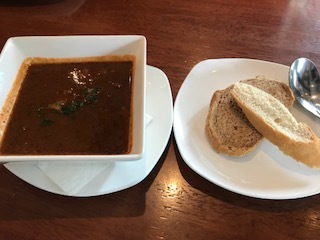 Well, turns out the goulash was chock full of thick hunks of tender beef and potatoes… so much for a “light lunch” As expected, the soup was incredibly hearty and flavorful. My mom really enjoyed it . Spicy Chicken Sausage- After waffling between Haxe and sausage, I then waffled between the varieties of sausage. In the end, I chose the spicy chicken sausage, just to try something new. It came with potato salad and sauteed sauerkraut. I must admit, I was disappointed by the sausage. It was far from the worst, but the spice completely overwhelmed the taste of the meat. The sides on the other hand, were amazing, especially the kraut. Boiled Pork Sausage- Since I got the chicken sausage, my dad got the pork sausage. 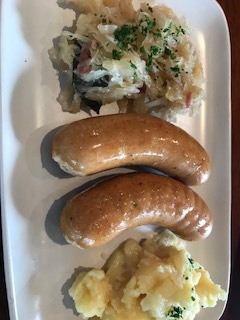 It also came with sauerkraut and potato salad. After having a taste, I regret not ordering this. It was by far the best sausage I’ve had in China. The meat was finely ground and well mixed, no globs of fat. It was also not greasy or overly oily by any means. The chicken wasn’t great… the pork was good…. I wonder how the veal is…. I must say I loved the portions of the dishes. I’ve always been a meat over carbs kind of person and I was really impressed that there was far more meat than potatoes on the plate. Also, unlike most restaurants, a “single order” isn’t actually a meal for 4. The service and atmosphere were both pretty good. The food arrived incredibly fast, but the staff didn’t remember to get us water until we were literally done eating. 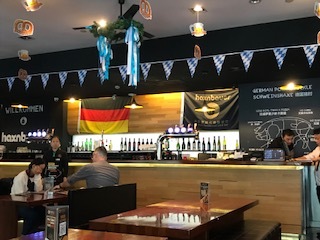 The atmosphere was like a typical bar with the sports channel playing and beers on tap. Of course, since it was midday, it was lacking the excitement. Overall, this is probably one of the better places for German food. I definitely want to go back and try the Haxe and more sausages. So, that’s it for this week! I hope everyone has a great week and see everyone soon!